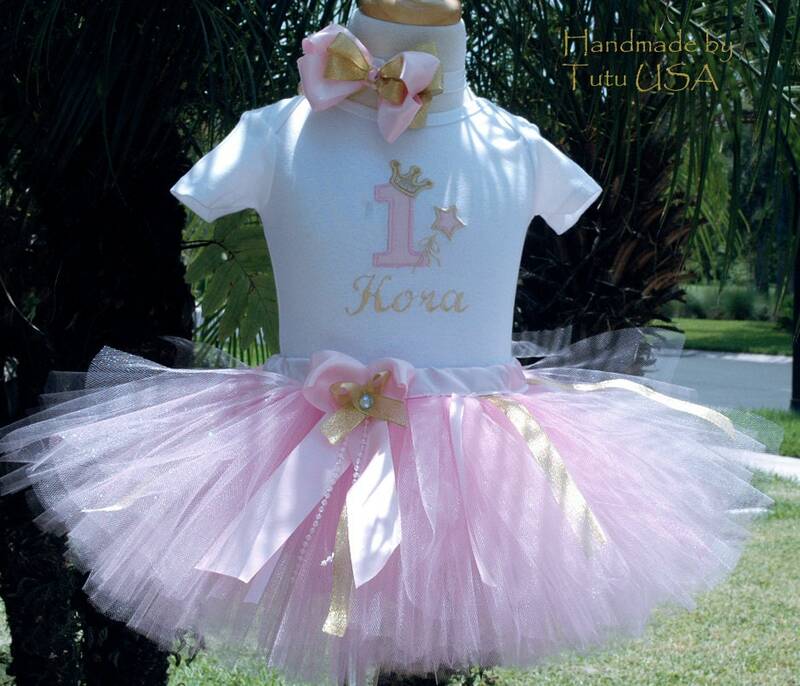 Adorable Fairy Wand Pink and Gold Baby Girls First Birthday Outfit.Baby Girls One Of A Kind 1st Birthday Tutu Outfits. Custom Made. Each is delicately handcrafted to perfection.Looks adorable in pictures. Shirt features a number 1 with a Fairy Wand embroidered by an embroidery machine. Tutu skirt has been created with soft high quality tulle. We have spent a generous amount of tulle that has been hand cut to create a very full look on this beautiful tutu. We have used many soft pink and gold including sparkly pink tulle. Beautiful pink strands of ribbon surround the tutu. Gorgeous long bow in front of the tutu..This beautiful tutu is very full and has been sewn not braided! The waist features a beautiful soft pink fabric.